For two years, Richard and I have been looking forward to Star Wars Celebration Chicago. Well, let’s keep it real – we’ve been looking forward to this since the last hour drew to a close on Star Wars Celebration Orlando in 2017! Join me on a daily journey through this special convention. I’ve updated this post each day with a compilation of pictures, social media and experiences we had throughout five crazy days of con madness. One day more!!! (Don’t worry, I won’t take this moment to break out into a Les Miserables tune) This is the first time Star Wars Celebration has been 5 days, and we took full advantage. The morning began with The Phantom Menace 20-year Anniversary Panel. There was so much love for Jar-Jar, it was heart-wrenching. Time really does heal all wounds. By far the biggest ovation was for Ahmed Best when he joined Warwick Davis onstage. Another great moment: while George Lucas did not appear in the auditorium, he did record a message. 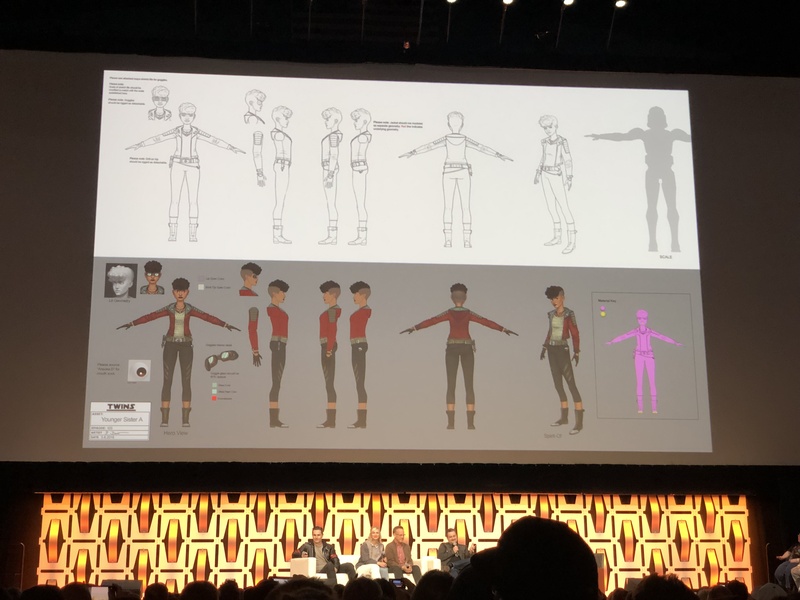 Executive producers Justin Ridge, Athena Portillo, and Brandon Auman introduced the Star Wars: Resistance Season 2 panel. They were joined by cast members Christopher Sean (voice of Kaz), Suzie McGrath (voice of Tam), Scott Lawrence (voice of Yeager), Myrna Velasco (voice of Tora Doza), Donald Faison (voice of Hype Fazon), and Bobby Moynihan (voice of Orka). The early portion of the panel was devoted to the look, sounds and feel of the show, something that moderator David Collins could contribute to as he is a sound engineer on Resistance. One fun nugget of information Justin Ridge let slip: Season 2 will pick up right where Season 1 left off. In particular, Tam Ryvora was last seen voluntarily choosing to leave the group on a First Order shuttle. What will happen to her? If you want to learn more about Galaxy’s Edge, especially the merchandise, you can view all our videos here. In years past, Star Wars Celebration happens once every two or three years. Well, we got a surprise announcement today at the Closing Ceremonies. The next Celebration will happen next year in ANAHEIM!! We do not have a definitive date yet, but the convention is on our home turf and we couldn’t be happier. Also, Galaxy’s Edge will be open and thriving. While I assume it will be massively crowded before and after SWCA 2020, I’m looking forward to seeing all the friendly faces I see at Celebration appearing in line and at Oga’s Cantina in Galaxy’s Edge. It’s gonna be a party!! 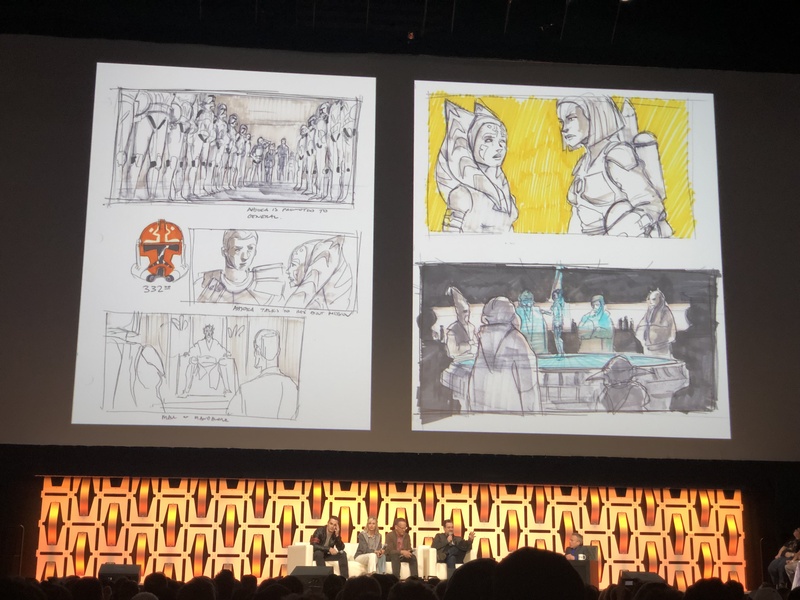 Skywalkers, I hope you’ve enjoyed our daily recaps of Star Wars Celebration. Sleep doesn’t always jive with a packed schedule of panels, meet-ups and Multi-Club Bashes – 2am was my bedtime nearly every night. But it was worth it to bring all of you along on our journey, Skywalking Through Star Wars Celebration. Today was all about the new Disney+ streaming TV series: The Mandalorian and Star Wars: The Clone Wars. And of course, more NEW Galaxy’s Edge merchandise! 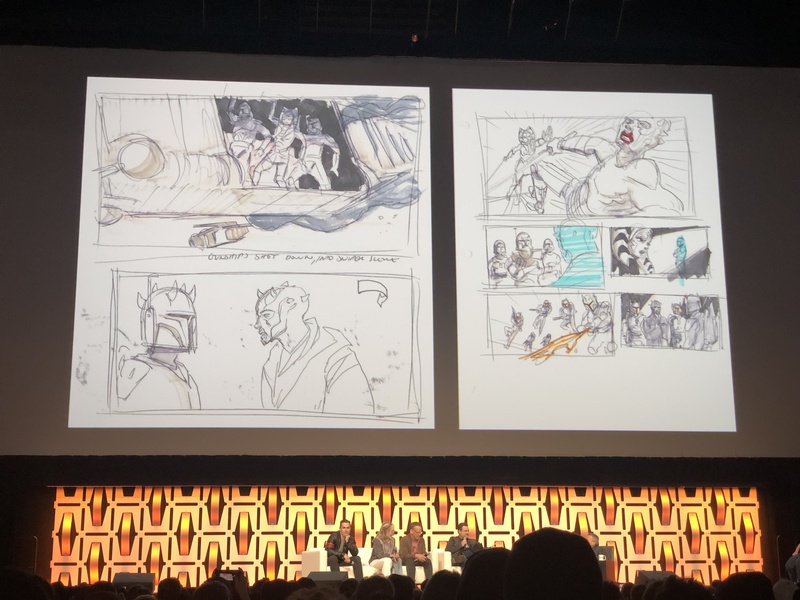 Today, Jon Favreau (writer/executive producer) and Dave Filoni (director/executive producer) joined Kathleen Kennedy (executive producer) on the Celebration Stage to reveal a few details around the mysterious The Mandalorian, of which we’ve only seen one photo from Lucasfilm. Right away, we were treated to a new show logo. Then stars Pedro Pascal (“The Mandalorian”), Gina Carano (“Cara Dune”) and Carl Weathers (“Greef”) turned up to talk about their characters and teased an early look at the first ever live action Star Wars series. I was especially taken with the camaraderie between Favreau and Filoni, who met in 2006 while Filoni was just starting The Clone Wars and Favreau was working on Iron Man. The two shared a love for Star Wars, and now they get to work on it together. Star Wars: Galaxy’s Edge – DROID DEPOT Merchandise Revealed! All you need is this video! Over the past 10 years, we’ve invited Ahsoka, Anakin, Obi-Wan, the Clones, Padme and countless more into our homes. Star Wars Weekends in Orlando showcased the voice actors for this series, allowing a whole generation to grow up meeting and greeting the cast year after year in Orlando from 2008-2015. The cast itself often record together, and even after the show was cancelled, they have the occasional dinner gathering. Therefore, the return of this series that created a generation of Star Wars fans is a big deal. And Lucasfilm put on a show! First, Dave Filoni treated us to a reel of seasons past, setting the tone. Then he brought Ashley Eckstein (voice of Ahsoka Tano), Sam Witwer (voice of Maul) and Dee Bradley Baker (voice of the Clones) to the stage. They talked about each of their characters’ previous journeys and hinted at where they would go and who they would meet next. And concept art! 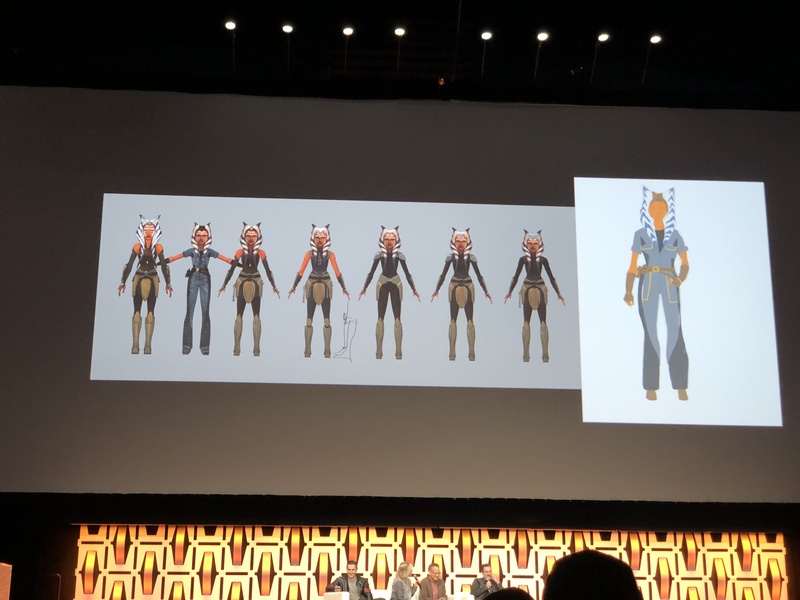 Filoni picked up where he had left off in Celebration Europe, where he brought Ashley Eckstein to tears describing Captain Rex’s Clones responding to Ahsoka in the Siege of Mandalore. In this panel, we got to SEE some of this! Animation technology has advanced so much that now huge Clone vs. droid battles are possible. 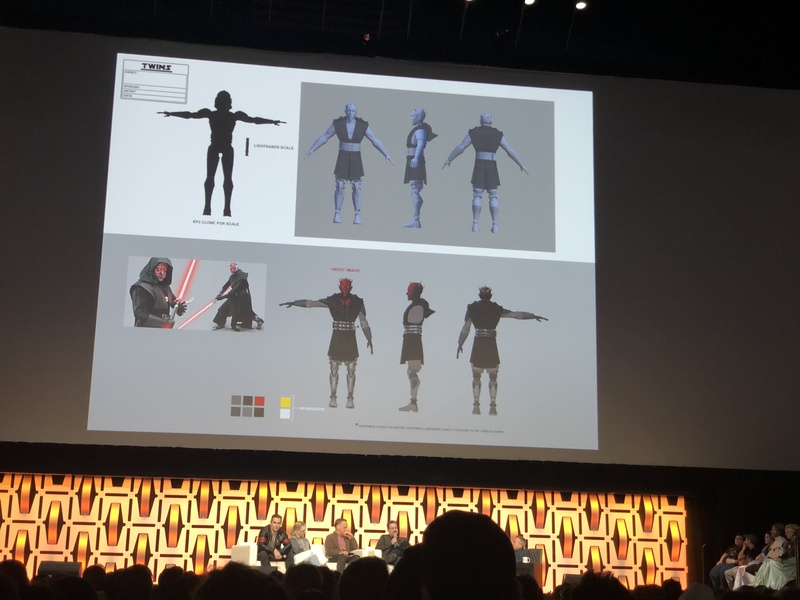 Also possible: Ray Park in a motion capture suit that will allow his unique movement to help Maul come to life and fight Ahsoka in the Seige of Mandaloree arc. In the trailer for this final season, we saw about a half second of this fight, and it was enough to get me excited! But before Dave Filoni rolled out new clips from the 7th and final season, he brought on stage the family we were missing: Matt Lanter (voice of Anakin), James Arnold Taylor (voice of Obi-Wan), Cat Tabor (voice of Padme), Tom Kane (voice of Yoda) and Matt Wood (Roger Roger, General Grievous). As a HUGE fan of The Clone Wars and Timeless TV Series, seeing Matt Lanter in person was a personal highlight. The Clone Wars topped my list of favorite Star Wars Celebration panels. As a capper, we all received a mini-poster of Ahsoka Tano mid-Maul-fight. I couldn’t help tearing up. She means so much to so many, including me. Star Wars: The Clone Wars Season 7 does not yet have a release date, though it will be streaming on Disney+ some time after November 12th. Star Wars Celebration Pro-Tip: Hang out at the local convention hotel bar after hours, you never know who you may meet. Here’s a collection of photos from Sunday night. Our favorite Boba Fett – Daniel Logan – dropped in to share Star Wars excitement! The Galaxy’s Edge booth had new merchandise today!! Enjoy a look at all the plush and especially this cute Kowakian Monkey Lizard. Who wants a porg to call their very own?? Arriving at Disneyland on May 31st! Today was my Fangirls Going Rogue Podcast Stage! It was a super fun show and we had these great buttons for everyone who attended. Lando Calrissian makes an appearance in Episode IX, and he made an appearance onstage! The scoundrel garnered a standing ovation from the crowd. Also revealed, new cast member Naomi Ackie as Janna (no last name). When asked if she was related to Lando (perhaps his daughter), she dutifully sidestepped the question. But we all know what’s up. What Episode IX panel is complete without John Boyega, Oscar Isaac and Daisy Ridley? They appeared and their incredible chemistry was on full display. Oscar and John joked about their on and offscreen bromance, and Daisy was full of cute quips. One of the loveliest moments occurred as Stephen Colbert turned the conversation and questions over to Kelly Marie Tran. Let me preface what happened next. Back when The Last Jedi opened, dissatisfied fans took to social media to declare their dissatistfaction with the film. Kelly Marie Tran took the brunt of their vicious comments, and was actually forced to close her Instagram account to stop the barrage of hate. Back at the Episode IX panel: before Kelly could answer any of Colbert’s questions, the crowd stood up and applauded loudest and longest. We knew the pain she had gone through, and wanted to help in any way we could. Kelly was not the only one with tears in her eyes after that. Finally, after nearly an hour, JJ Abrams rolled the Teaser Trailer!!! The Rise of Skywalker. What does it mean?? We just have to wait until December to find out. At 4pm, we put on a show for all of you Skywalkers! We had a discussion on the Episode IX Trailer, some fun surprises, a game and the debut of “Song for Celebration” by Din of the band F-105! We will be sharing the live show as a Podcast later on, so now please enjoy a round-up of social media that gives you an idea of the show. Woot! @SkywalkingPod swag at #StarWarsCelebration podcast stage! Looking forward to the show in just a few minutes! Thursday dawns. Unlike any previous Star Wars Celebration, this one is 5 days long – Thursday through Monday. And because of this, the show floor opens at 1pm on Thursday and there are no panels! So by default, we are going to explore the Show Floor. The booth that draws our eye first is Star Wars: Galaxy’s Edge. Spires surround a huge booth with 3 photo ops, prop replicas, and MERCHANDISE! One of the biggest surprises? An actual ride vehicle for Star Wars: Rise of the Resistance!! We also got a preview of merchandise. Would you like to side with the First Order or the Resistance? Here you will have your choice. TIP: Each day of Star Wars Celebration, Galaxy’s Edge booth will have new merchandise on display. There are special times for Merchandise Demonstrations. We can’t wait until Monday, when we can see items from Dok-Ondar’s Den of Antiquities! Imagineers will also be on hand at certain times to tell us more about Galaxy’s Edge, coming to Disneyland on MAY 31ST!!! After this booth, I raced over to Po-Zu Shoes, a fabulous company that provides sustainable and ethically sourced shoes – and they happen to have a Star Wars license. 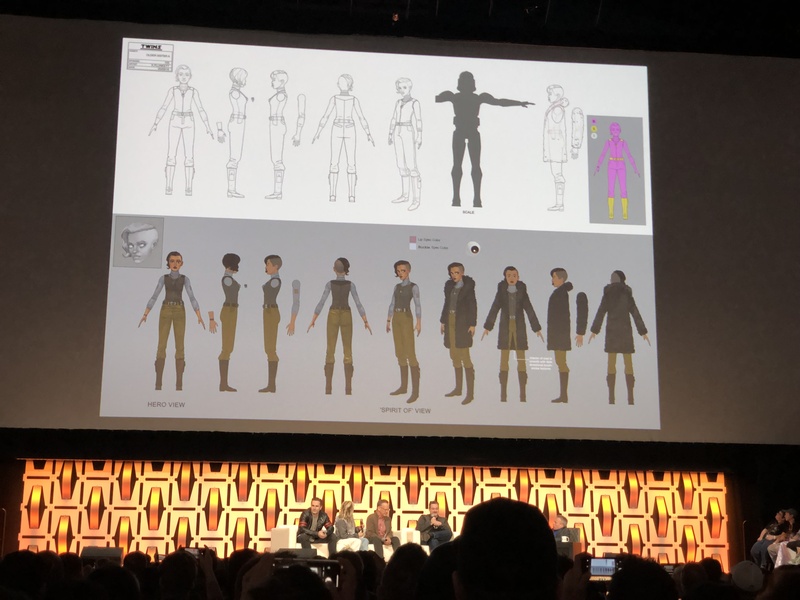 In fact, they provided Daisy Ridley with her boots for Star Wars: THE FORCE AWAKENS, and now have several styles and colors of “Rey Boots”. The most recent: silver linen. Well, I tried them on, fell in love, and had to have them. These @po_zu Rey Silver linen boots are FANTASTIC! So light, so comfy and such a subtle sparkle. They are elegant to the max. A definite “investment” shoe, as I will wear them all the time, even in summer. Make sure to check out @po_zu at #StarWarsCelebration at Booth 5315 near @ranchoobiwan! After checking out several booths and trying to figure out what to buy and how much money to spend, it was time for the first meet-up of the convention: The Hoojib Hop! Hoojibs are part of the Star Wars expanded universe – they first appeared in a Classic Marvel Star Wars comic. Hoojibs are little aliens that look like bunny rabbits. They are diminutive creatures that mean no harm, except that they eat electricity! We have embraced them as our podcast mascot, and demand to #MakeHoojibsCanon in the new Star Wars – Disney canon! As part of our persuasion, we all come together for a meet-up in which we don hoojib ears and hop around the Show Floor, proclaiming loudly “Make Hoojibs Canon!” What a blast!!! Thanks to Fantha Tracks for hosting our meet-up at their booth. Hoojib hoppin’ our way across #StarWarsCelebration! @regalrobot @tomspinadesigns @ranchoobiwan #jabba. Thanks to all our hoojibs!! What a way to cap off Day 1 of Star Wars Celebration! That evening was “A Night at Canto Bight” hosted by the 501st, Rebel Alliance, Mandolorian Mercs – basically a Multi-Club Bash! But what happens in Canto Bight stays in Canto Bight. You’ll just have to follow us on social media to see what craziness ensued. I will tell you that it was absolutely surreal to be dancing as R2-D2 and BB-8 next to two Twi-leks and Mara Jade while the band played Lapti Nek. Only at Star Wars Celebration. Our day really began on Tuesday, April 9th – a day of frantic last-minute sewing, packing and list-checking before we boarded a red-eye flight that evening. Almost there…. Richard is going to #cosplay at #swcc and needed Luke’s X-wing pilot flak vest. I’ve been sewing all week and finally completed it today!! One more thing to check off the endless #SWCC list. A third piece of luggage did the trick, plus some creative fairy wing finagling. At midnight, we flew! And @jeditink has landed! #starwarscelebration here we come. Had to transport my wings somehow, they just don’t fly themselves. After a layover in Minneapolis, MN and a short hop to Chicago, we arrived! Not two seconds after stepping into the hotel lobby, we ran into someone we knew (Hi, Marcus!). Within hours of hitting the convention center to pick up our badges, more friends started appearing out of nowhere. Star Wars Celebration is special. Not only for the panels, the droid-building, the excitement, but that sense of family and camaraderie you only get by sharing a common love. Each Celebration the bond grows stronger. Don’t forget, you can LIVE STREAM these panels and a few more as they happen, thanks to The Star Wars Show LIVE on YouTube. To get up-to-the-minute updates, please follow us on Instagram, Twitter and Facebook. We will be sharing IG stories as well, so just tap on that Instagram profile photo to explore more Star Wars Celebration!